After signing up, you will have full access to the VetPrep database including VetPrep Mobile and can begin reviewing immediately. Only VetPrep PowerLectures subscribers will be granted access to VetPrep PowerLectures. VetPrep reserves the right to revoke access to VetPrep PowerLectures at any time. By submitting the payment and authorization information, you agree to pay the subscription fee. After your payment is processed, you can access the study materials with your login and password. You agree to notify VetPrep immediately of any unauthorized use of your password. If you change your mind about reviewing with us or if your subscription is terminated by VetPrep, you may be eligible for a refund. If you cancel within 24 hours of enrolling and before utilizing any part of the online database, VetPrep PowerPages or VetPrep PowerLectures, we will refund your subscription price, less a processing fee of $15. If you cancel within 10 days of registration after answering less than 100 questions we will refund 75% of the subscription price, less a processing fee of $15. If you are unable to view VetPrep PowerLectures your subscription will be downgraded to a standard subscription with the difference in price refunded, provided you contact VetPrep Support within 72 hours of the first lecture you attend to cancel VetPrep PowerLectures access. All requests for refunds on subscriptions purchased on VetPrep.com must be made by contacting VetPrep. If the request is approved, refunds will be processed within 30 days of cancellation. Subscriptions purchased in the VetPrep iOS app, through the iTunes App Store, are only eligible for refund directly through Apple. VetPrep is unable to refund in-app purchases, however, customers should contact our Support Team and we will provide the steps necessary to request a refund from Apple. Please note that a refund from Apple is not guaranteed, regardless of the circumstances, and is not under VetPrep's control. VetPrep, VetPrep PowerPages, VetPrep PowerLectures, and VetPrep Mobile is designed to be used by veterinary students and veterinarians studying for board examination. All information, techniques, or materials are the property of VetPrep and may not be resold or reproduced in any manner. You acknowledge that these materials are protected by copyright, trademark, patents or other proprietary rights and laws. You agree that you will not provide any such information, techniques, or material to any third party for any reason. Your enrollment cannot be shared, sold or transferred to another person. VetPrep reserves the right to cancel your membership at any time in the event of any unauthorized use of your account, misuse of the test taking materials or this web site or any other violation of the online agreement. VetPrep will not approve requests for free extensions based on personal issues, which include but are not limited to ISP connection problems, time constraints, PC incompatibility, etc. Students who request extensions due to the fault of VetPrep servers may be compensated up to five days. All study material and content at VetPrep available through this website is property of VetPrep and protected by copyright, trademark and other intellectual property laws. During the membership period the user is entitled to personal, non-commercial use only. Users may not distribute, share, post, email, publish, upload, transmit, create derivative works of, modify, or sell any VetPrep content. 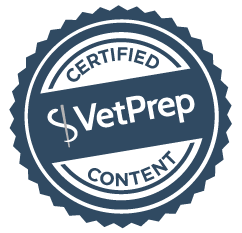 VetPrep reserves the right to limit access to any downloadable or viewable material. Violation of these rights is subject to criminal and civil prosecution. VetPrep takes all reasonable precautions to protect user privacy. Personal user information is not sold to third parties (name, email address, mailing address or telephone number). Website usage statistics and student performance on subscriptions purchased by individuals are gathered in an anonymous fashion for internal content review and external data reporting. User names, addresses, email addresses, or any other personal information remain anonymous in all reports, with the exception of school- and organization-purchased accounts which may include non-anonymized performance and usage data. User credit card numbers are not stored by VetPrep. VetPrep may use your information to contact you regarding problems with service or to request feedback in all areas of veterinary medicine. Data transmission can never be guaranteed to be perfectly secure. Although VetPrep takes all reasonable measures to protect your personal information, we cannot guarantee the security of any information that you transmit to VetPrep and all such transmissions are made at your own risk. Accounts purchased by colleges, universities, or other organizations on a user's behalf are eligible for faculty and administrator statistics review. Faculty or administrators will have the ability to view the user's progress and other performance data. Information viewable by designated faculty and administrators includes how much of the program each user has completed, the percentage of the questions each user has answered correctly, when each user has logged in, statistical data on user progress, and accuracy data on practice questions and timed exams. Faculty and Administrator Access is read-only and does not permit those individuals to log in to user accounts or view sensitive information such as passwords. VetPrep, VetPrep PowerPage, VetPrep PowerLectures, VetPrep Mobile and other marks and logos on our site are the trademarks of VetPrep Corporation. You may not use any trademark, logo or service mark appearing on this web site without the prior written consent of VetPrep. VetPrep Mobile is optimized for Android and iOS devices. It is also compatible with the latest mobile devices. Compatibility with older smartphones is not guaranteed.